This is Part II of a series. Part I is here. At first glance, the history of Dutch East India Company (VOC) linguistics is simply a history of texts. 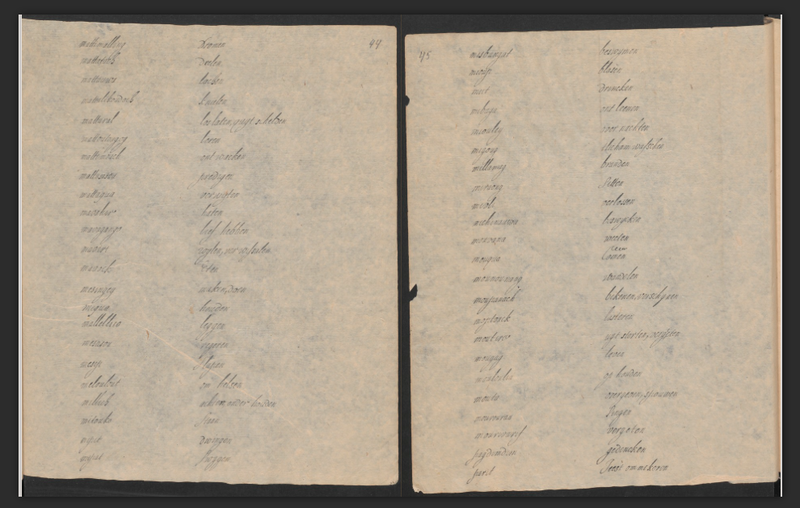 Published or not, edited, translated, or not – the wordlists, grammars and phrasebooks remain a witness to the times when Dutch merchants and missionaries started documenting the new cultures and languages they encountered overseas. But the historical reality is more multifaceted. Besides the ones kept in the main VOC archives, some of these Dutch manuscripts and printed books are scattered in private and public collections from Paris, to London, to Venice, to Sydney. How to reconstruct the itineraries of displaced books? How to uncover the real place of creation of a manuscript? How to decide whether two similar copies are related or not, and how to date them? How to establish authorship of anonymous works? The answers are contained in the very materiality of these objects. But to unlock them, we need to know what we are looking for. The main function of bookbinding is to protect the leaves and keep them together. However, the external visible elements, such as the cover and decoration (or, in the medieval manuscripts, the metal ‘furniture’­, i.e. clasps or ornaments) have, historically, also been an indicator of social status. 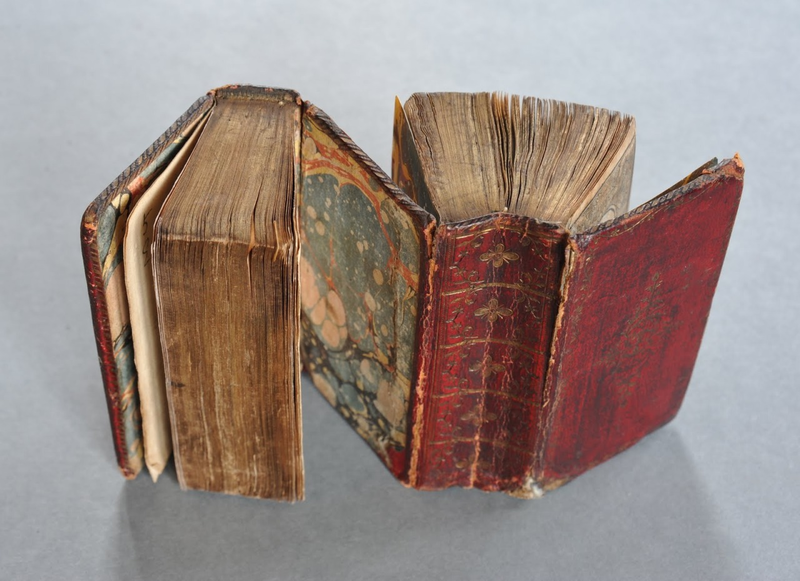 Books were often sold without covers – these were provided later by the owners to match their own collection. 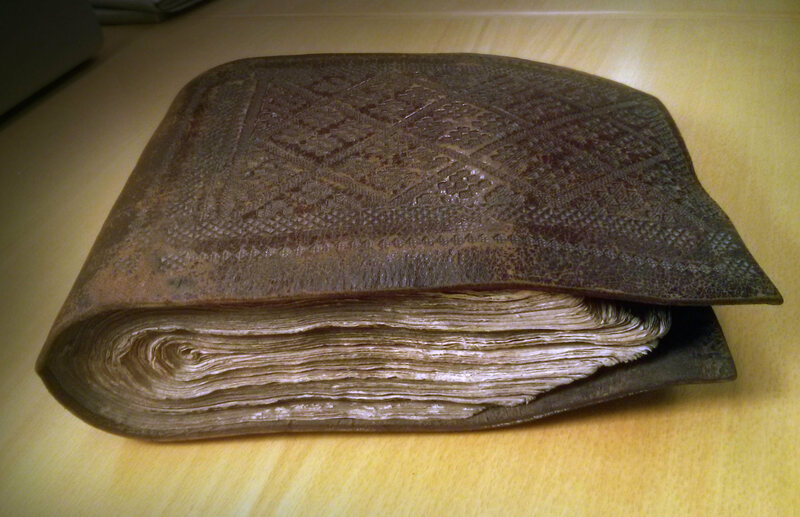 Although until recently the history of bookbinding was limited to the study of binding decoration, to an expert eye, it is precisely the covert internal structure, the type of sewing, endleaf structure, and the kind of endbands (the meticulous sewing at the head and tail of the textblock spine) that can reveal the most valuable information on the origin of a book. The sewing and covering of a book is called binding. A set of sheets folded, nested and sewn together forms a quire (also called a gathering or section). These are arranged side-by-side and sewn at the fold. By analysing holes at the fold of each quire we can see whether the book was rebound, or if it is in its original state. MS “Carmen Guzzuraticum” (Ms. Hasselquist, “Ex dono Reginæ Ludovicæ Udalricæ” UUB, O. Okatal. 3). In some cases, even the thread used for sewing might provide precious geographical clues, as in the case of unusual thick brown thread used in Ketelaar’s Instructie from Paris, and in De Tours’ Grammatica Linguae Indianae from Rome. The two unrelated manuscripts possibly share the same place of creation: Surat in India, and the analysis of the thread fibres could corroborate this theory. Just like contemporary paper formats, the book formats refer to how many times the initial sheet of paper was folded: once for folio, resulting in two leafs; twice for quarto – four leaves; three times for octavo – eight leaves, respectively abbreviated as “2o,” “4o” and “8o.” (Interestingly, in some catalogues, the manuscripts are arranged first by size, and only then alphabetically.) Usually, quires in one book are regular and contain from four to ten leaves. In the Middle Ages, eight leaves quires (quaternions) were the most popular in the West, while in Islamic manuscripts, for example, the norm was quires composed of 5 folded leaves (i.e. 10 pages). If the quires are irregular, like in the manuscript of François-Marie de Tours’ Grammatica Linguae Indianae, where consecutive quires consist of 20, 16, 10, 14 and 18 leaves, it may suggest that the book was created by an amateur. Unlike in modern books, where each page is numbered separately, in medieval codices only individual leaves were numbered (if numbered at all). In each folio (from Latin folium, pl. folia), the two sides are then referred to as recto (the page on the right as you open a book) and verso (the reverse) (hence page references such as 14v, or 22r). 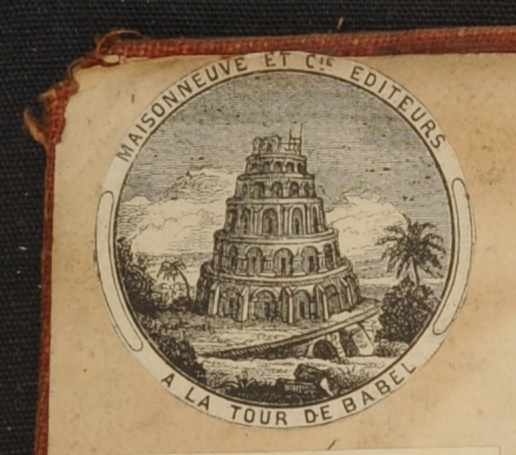 This order is opposite for books written in right-to-left scripts, so that the European “front” is Oriental verso. As obvious as it seems, the orientation of the text may sometimes be overlooked. One such examples is an anonymous Persian-Dutch vocabulary from Leiden University Library, miscataloged as “nautical and botanical” just because these two sections are at the “European” front. In fact, it is a classical thematic vocabulary, starting with God, the world, planets, etc. and ending with botanical and medical substances (the chapter on the ship equipment is a separate addition altogether). Accordingly, its title page figures on the verso of the last folio in the European system – so, the “very end” of the text. Since, to avoid this confusion, another system has been introduced, with the terms ‘left’ and ‘right’ instead of ‘upper’ and ‘lower’ or ‘front’ and ‘back’. Source: Universiteitsbibliotheek Utrecht Hs. 1483. 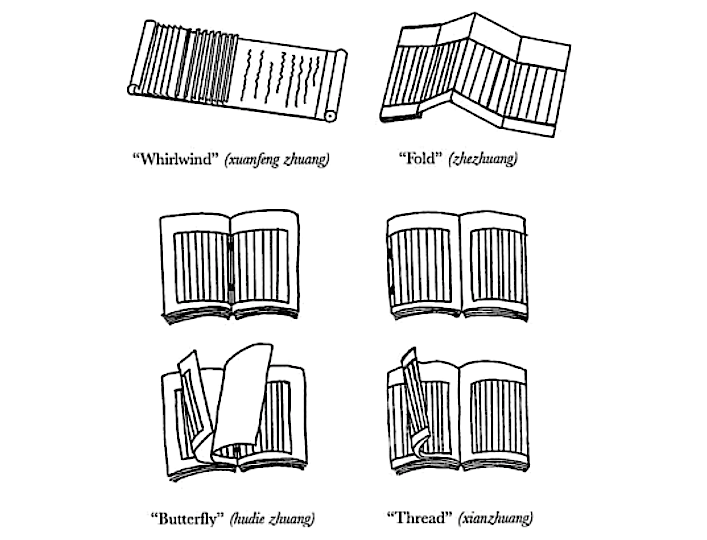 Chinese book binding types. Source: Burkus-Chasson 2005: 372. Unfortunately, due to a later re-binding, it is hard to check how the pages of the manuscript from Utrecht were originally glued together. It would be interesting to compare the binding with those of contemporary Chinese manuscripts from Taiwan to confirm whether the MS was initially created there by a local bookbinder. The technical description of quires and number of pages in each quire is called collation. It can be enlightening – or really confusing. On the basic level, it shows whether a manuscript was bought blank and bound, or whether the binding took place after the writing. However, the history rarely stops there; books and manuscripts are notoriously being “doctored”, i.e. leaves are added or removed to produce a “more perfect”, or sophisticated copy. It takes a real expert to uncover such practices when they are done for monetary gain; but even when the modifications are done openly, the motives may not be clear. 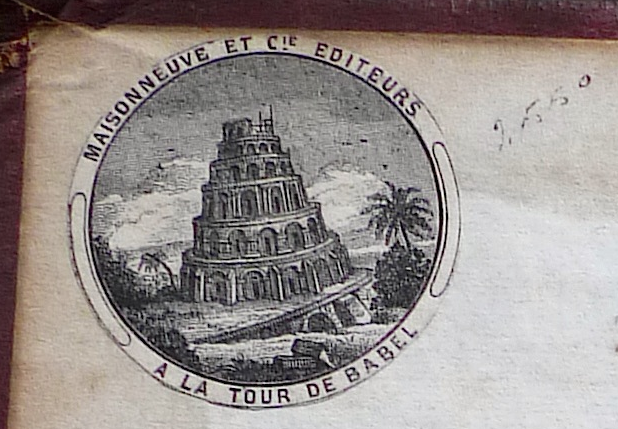 Anquetil Duperron added his introduction as well as extra title page in the middle of Thesaurus Linguae Indianae by Francois-Marie de Tours ­– was he possibly preparing it for publication? Sadly enough, loose pages from manuscripts, especially illuminated codices, accumulate more money at auctions than the complete manuscript would. At this stage, the only way to reunite them is by reassembling them in virtual space – the main objective of projects such as manuscriptlink. However, when we look at the quire structure, we realise that in fact, three pages have not been removed, but added at the beginning. They must have come from a book of which further part was not relevant to the Malay language and therefore discarded. The analysis of disjecta membra can also add to the understanding of book’s history. Provenancing, i.e. 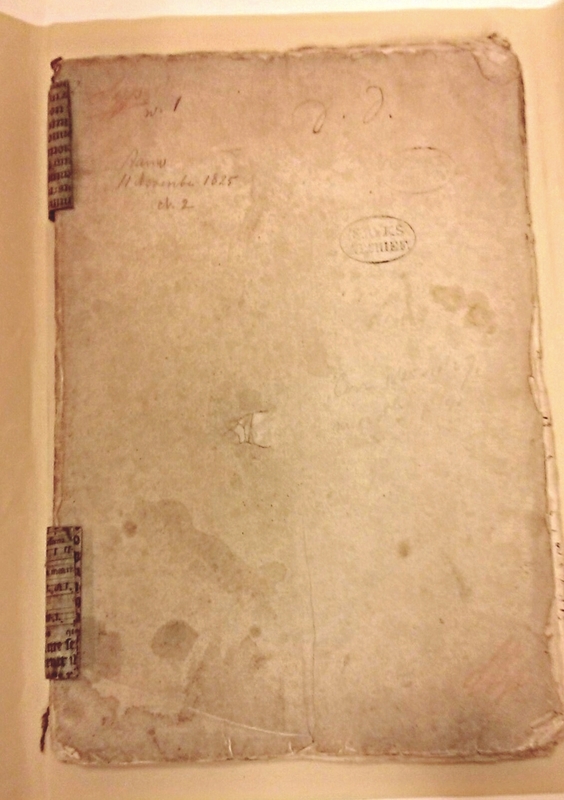 determining the chronology of the ownership and location of a book or a manuscript, can be studied in two ways: by examining the item itself (bookseller plates; labels; symbols and inscriptions), or by finding references in external sources, such as auction catalogues, library records, etc. Personally, I’m particularly interested in ‘catalogues du feu…’ (‘of the late…’), prepared after the death of a (famous) person: it’s as close to peeking into the persons’ library as it can get, trying to understand their influences. We have to keep in mind that provenance is not the same as origin. However, it can help authenticate the object. It can also be as lucrative as it is fascinating, even in modern manuscripts and books, where a proven ownership by an important or famous person can increase the value of a book tremendously. Biggest auction houses hire exceptionally skilled ‘book detectives’ who can easily recognize less obvious clues, such as bookseller’s price codes (booksellers typically avoided writing any prices on books explicitly, yet they still needed to remember how much they paid for a book, so for this reason they developed idiosyncratic price codes they could use to identify the price). In the case of the Dutch linguistic documents from the times of the East India Company (VOC), provenance is particularly important for two reasons: in many cases, we find linguistically significant texts with no information on the author; equally often, we may know of famous Orientalists – but lack any actual books written by them. Knowing the history of individual manuscripts, we can trace the connections, textual transmission, and even establish the authorship. 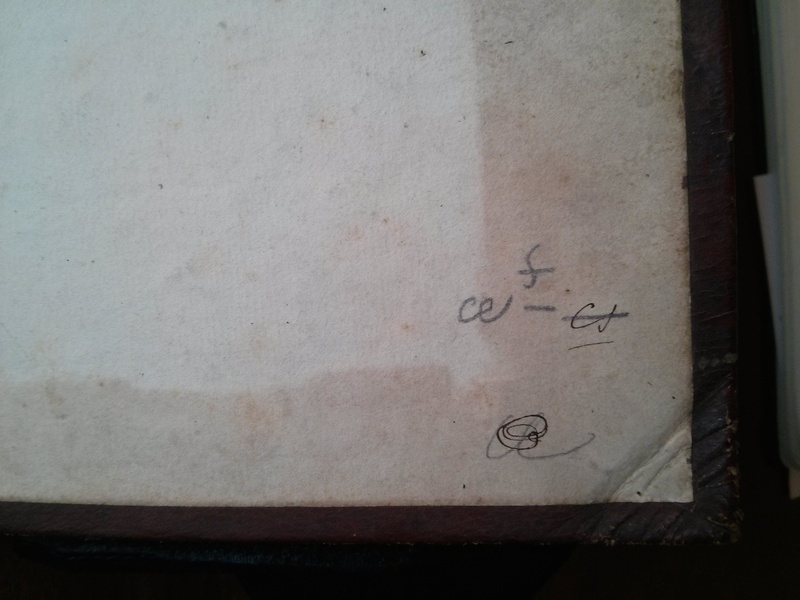 In the example below, we see identical bookseller plates on two unrelated 17th c. Dutch manuscripts, which proves that they were in the same bookshop in Paris at around the same time. 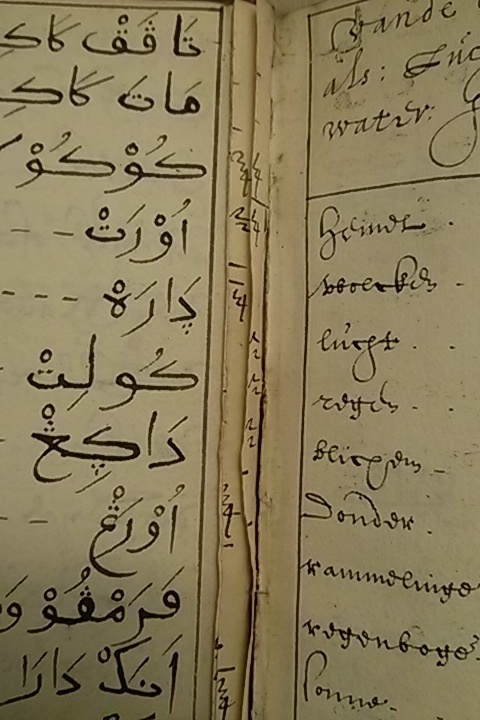 This may explain the mistaken dating of the first Hindustani grammar; Emilio Teza, who bought the Malay grammar (right), was also the first one to mention the year in relation to Ketelaar’s work (left). Ketelaar’s manuscript disappeared for years, yet the date 1715 entered into the received history of linguistics. Right: Malay grammar (Biblioteca Marciana, Legato Teza, Or. 237). 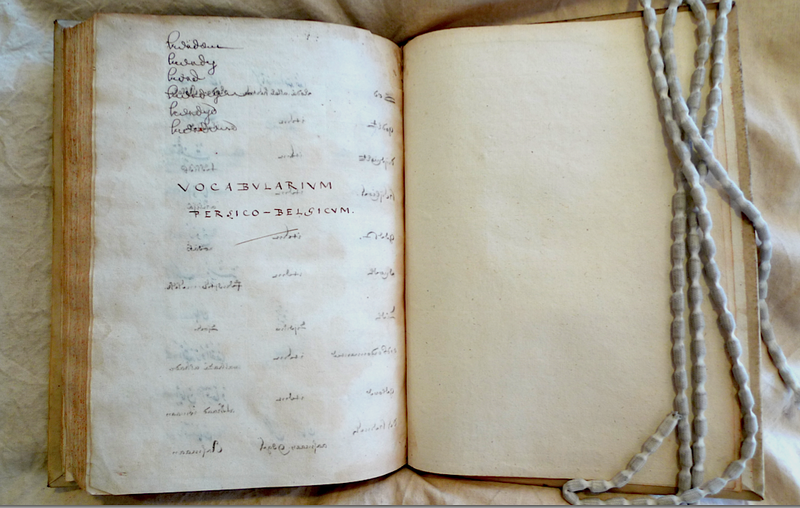 Left: Ketelaar’s Hindustani grammar (Fondation Custodia MS 1991-A615). The number 2550 refers to Maisonneuve’s catalogue from 1872. The principle of archive provenance states that fonds (documents originating in the same source) and collections should be kept together. When the only available piece of information is what other books or manuscripts are next to the particular item on the shelf, with some luck and a lot of searching, it may nevertheless be a useful start to uncover its history. The study of marginalia, or the handwritten notes and comments left in the margins by the reader (presumably owner) contribute to our understanding of reading practices, as well as the social and intellectual impact of the text. One great example is a monumental study of all 560 copies of first and second edition of Copernicus’ De revolutionibus orbium coelestium (1543) tracked down by Owen Gingerich. He described the fascinating story of his research in The Book Nobody Read: Chasing the Revolutions of Nicolaus Copernicus. Appreciating the true value of what may seem to many to be simple vandalism, twelve special collections libraries from the Netherlands, US and England joined forces to create a digital archive of early modern annotated books. Other libraries create their own online projects, as University of Pennsylvania Rare Book & Manuscript Library did, appealing to the broader public for help with identifying annotations. We are merely an episode in the life of objects. I hope the next time you hold a crumbling and stained manuscript in your hands, you’ll search for the story it has to tell; the story of people who created and owned it over the years; the memory of places enshrined in plant fibres, leather, ink, and sand. Burkus-Chasson, Anne. 2005. “Visual Hermeneutics and the Act of Turning the Leaf”. In Cynthia J. Brokaw, Kai-Wing Chow. Printing and Book Culture in Late Imperial China. University of California Press. Brown, Michelle P. 1994. Understanding Illuminated Manuscripts: A Guide to Technical Terms. J. Paul Getty Museum: Malibu and British Library: London. Pearson, David. 1998. Provenance Research in Book History: a Handbook. New Castle, Delaware and London, England: Oak Knoll Press and The British Library. –––– 2012. Books As History: The Importance Of Books Beyond Their Texts. New Castle, Delaware and London, England: Oak Knoll Press and The British Library. Pickwoad, Nicholas. 2000. 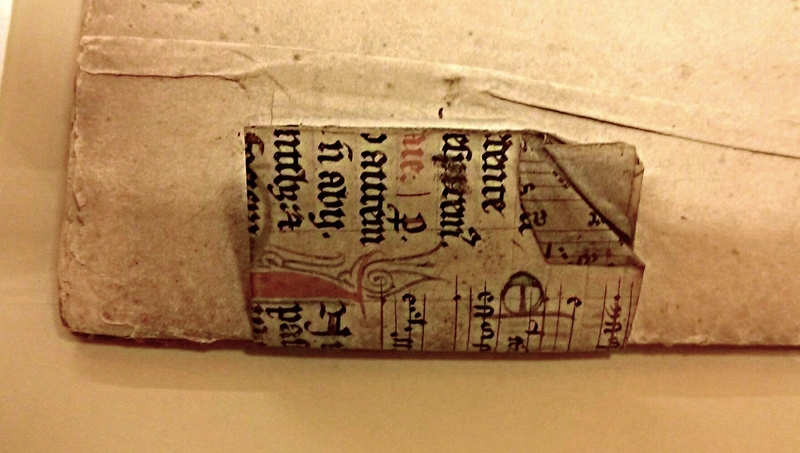 “The Use of Fragments of Medieval Manuscripts in the Construction and Covering of Bindings on the Printed Books.” In Interpreting and Collecting Fragments of Medieval Books. Proceedings of The Seminar in the History of the Book to 1500, Oxford, 1998. Brownrigg, Linda L. & Smith, Margaret M. (eds.) 1–20. Los Altos Hills (CA); London: Anderson-Lovelace; Red Gull Press. Sharpe, John Lawrence. 1999. “The Earliest Bindings with Wooden Board Covers: The Coptic Contribution to Binding Construction.” In International Conference on Conservation and Restoration of Archival and Library Materials. Erice 22nd-29th April 1996, edited by Carlo Federici and Paola Munafò, 2:455–78. Palermo: Palumbo Editore. thanks for making this so clear and easy to understand. i enjoyed it a lot.